I’ve been delaying writing this blog about death in Thailand, but now seems like an appropriate time. Next door to my home around a couple dozen people gathered around two monks chanting and the corpse of a woman*. She’s the grandmother of the house and has been in very poor condition since I moved in last April. Death in Thailand is unlike America. It’s more understandable. It’s less sad. It happens. It can still be shocking and has an aura of sadness to it, but it’s much more accepted in this Buddhist nation. Thais talk of dead relatives like Americans talk of a flat tire. A teacher was tired one day and I asked her why. “My brother was in a motorcycle accident yesterday,” she told me. But that was all there was to it. She was tired and a bit sad, but she still came to work. I’ve seen the same with major injuries. I rode a taxi-truck into town once with a guy in his twenties laying on the floor. I knew his sister, who was also in the truck. She told me he was in a motorcycle accident and couldn’t walk. The guy was smiling and playing with a baby! Yeah, I’m paralyzed. What ya gonna do? The Thais have an incredible aptitude to walk it off. One man who would appreciate a Thai funeral. I attended a village funeral and knew one of the granddaughters. For 95 to 99% of the attendees, the funeral is a celebration. There are certain rituals performed, but smiles can be found on most in attendance. I saw a few tears from the immediate family, but only while they spoke of the departed. The cremation of the body was interesting. The casket was placed atop a stack of wood ties and sticks. Before the fire is started, the immediate family is allowed to take one last look at the departed. They weren’t shy. They were taking pictures and talking around the grandmother. After all the attendees brought a stick or two to the base of the coffin, the area was cleared and doused with gasoline. Fifty feet from the flammable deceased is something resembling a bottle rocket. It’s attached to a string that’s goes from a tree to the pile of wood under the coffin. When everyone has said their goodbyes to the body, the rocket is lit and propels with trailing sparks to the wood pile. The gasoline caught fire instantly and soon the coffin was covered in flames. Hunter Thompson would have loved it. From a distance, I usually can’t tell if a party is a wedding, monk ordination or funeral. They’re all full of drinking, partying and smiles. *As of the morning of Wednesday, January 11, 2012, she’s not dead. I guess the monks chanting are the equivalent of her last rites. 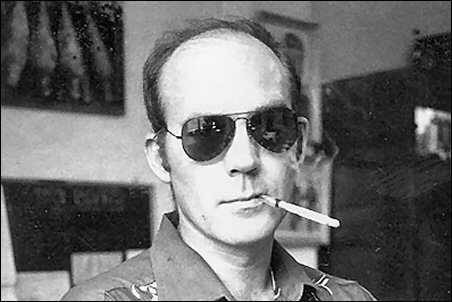 This entry was posted in Peace Corps and tagged death, hunter thompson, peace corps, thailand by Jeff Jackson. Bookmark the permalink.